If you've been following us for a while, you know that we believe you shouldn't keep asking your subscribers to subscribe. That's why we created the SmartLinks feature as one of the most straight-forward ways to make a website "smarter" and more effective. In short, Signup Segue allows you to create 1-click "instant" signup links that you can send to your email subscribers. Through a Signup Segue link click, you can instantly add an existing subscriber to a new service, without having to ask them to subscribe again.​ Typically, this comes in handy when you're doing a live webinar. You send an email to your list, containing a link. Subscribers click on the link, which takes them to a signup page for the webinar. They fill out the form on that page, to register for the webinar. They see a confirmation message from the webinar service (and this page is a dead-end page with nothing further for them to do). There are a few problems with this process: first, we're asking the subscriber to fill out information that we already have about them. The signup form for a webinar is pretty much the same as the signup form for a mailing list. Because of this extra step, we're losing conversions. Some people can't be bothered to fill out another form or might not have enough trust to do it ("what am I signing up for, here?"). 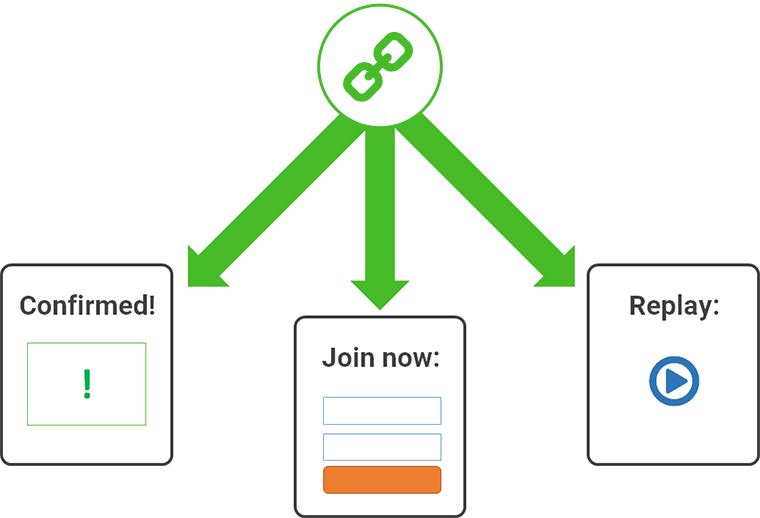 ​Signup Segue solves this problem by generating a link for you, which will instantly sign up any subscriber that clicks on it, to your webinar event. No signup pages or extra steps needed. By inserting these merge fields in the URL, you can create an individual signup link for each one of your subscribers and their details can be passed on to the webinar system without them needing to fill out another form. The signup happens instantly, in the background and the subscriber is directed to a custom confirmation page. That means you still have the subscriber's undivided attention and you have full control over what is shown on this page. If you just want to display a simple confirmation message, you can. ​Advertise a premium product or service on this page, to monetize it. Display ads or affiliate links after your confirmation message. Link to your latest blog content, to get more readers. Offer a free report as a signup bonus (also a great way to get subscribers prepared and excited for the upcoming webinar). Add social buttons and invite your subscribers to share your webinar registration page or follow you on social media. Those are just a few ideas. No doubt you can think of many more useful options for your specific business and market. When using this feature, you can define when your even is taking place and how long it will take. 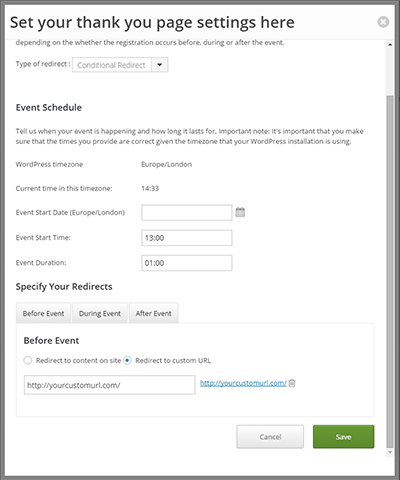 Then, you can set different redirect options for before, during and after the event. ​When someone clicks on the Signup Segue link before the webinar event, they are directed to a confirmation page with a reminder about the webinar date and time. When someone clicks on the Signup Segue link during the webinar, they are sent to the GoToWebinar registration page - because that's the most convenient way to join an ongoing webinar. When someone clicks on the Signup Segue link after the webinar has already ended, they are sent to a page that initially shows a "sorry, you missed it" message and later shows the webinar replay (once that is uploaded). And this all happens on click of the exact same link, in the same email, just depending on the time and date of when the click happens. The Signup Segue feature is available right now, in the latest version of the Thrive Leads plugin. It's one of the more advanced and also more powerful features we've added, lately. And as usual, you'll find this feature to be highly flexible. I have no doubt that you will find many ways to use this to your advantage, that we haven't even though of yet. Nothing is more embarrassing then forgetting someone’s name when you see them again. Thanks for this. Speaking of webinars though, have you looked into, or has anyone else used the new GetResponse Webinar service? It’s about half the price of GoToWebinar. Would be nice to hook it up with Thrive Leads if it’s a worthy contender? I didn’t know about GetResponse webinars before. I’ll have to look into it, to see how exactly they work. As always this is an amazing new feature!! Great work! I’m getting reassured every week that I’m happy to be a Thrive Member. One question though: if a subscriber of your email list clicks in the email on the link and he will then automatically being redirected to a thank you page; then in the meantime you have processed personal data of your subscriber without explicitly telling him or her that. How do you handle that? Because according to European data protection law you have to inform the data subject explicitly about how and why you are processing personal data. Actually: for every purpose that you are collecting personal data, you have to get consent by optin in. I’m very curious how you handle that. The idea is that you don’t use the data “in secret”. In the example above, you advertise a webinar in an email you send out. You explain what the webinar is about and when it takes place, in your email. And then you tell the reader that if they want to join the webinar, they should click the link. When you do it the “old” way and send them to a webinar signup page instead, you’re not actually collecting personal data. You already have that data and the subscriber already has opted in. You’re just making them repeat the same steps, without new data being collected or processed. If I am using ActiveCampaign to nurture a lead and at some point want them to update their profile to tell me more about them (like their company name and their interests) I want to give them a link in my AC email to a form on my website that already has their name/email pre-filled and then they can just give me the updated info. I was going to use Gravity Forms for this because I can pass the name/email in the URL of the link and have GF dynamically fill in those fields, then integrate that GF form to talk to AC. Any way to do this with ThriveLeads directly instead of using GF? We don’t have a feature like that yet, but it sounds like it could be an interesting addition. The simple way is to get a shortcode that gets the email passed through get and shows it on the page. And the user could use it on a custom form or where his creativity tells him. Glad this is a feature that came at the right time, for you. Awesome feature, thanks for adding this! They are really building a great platform, especially since they will be moving away from Google Hangouts next month in favor of technology that’s instant and doesn’t have a 30sec delay like everything based on GH pretty much has. Thank you for the suggestion, Nick. I’ll have a look at this platform. Any update on this? I signed up with WebinarNinja and I’m trying to figure out how to use it in the most efficient way possible with my Squared Theme. Help? +1 WebinarNinja is getting some major press and it would be very helpful to create an easy integration. +1 for Webinar Ninja please! This is great. What else could it be used with other than webinars? It can be used with all the services we have API integrations for. So, anytime you want to make a connection between two services without repeatedly asking for the same information, you can use this. This is gonna change the face of webinar signups – Congrats guys, AWESOME work!!! Great stuff like always! Congratulations! I wanted something like this for a long time! Is this just available for GoToWebinar or other webinar platforms? We currently support GoToWebinar and WebinarJam. Other webinar platforms we can add, depending on demand. This is sooooo awesome, Shane! Thank you. I think WebinarJam is the future. Glad to see you integrating it for that. Massimo! Thanks for stopping by! We’re users and huge fans of Adespresso. Don’t know how we’d manage our FB ads without it. And I also massively admire the branding and content marketing work you guys are doing. I absolutely LOVE how the Thrive Team is always improving their products! This Signup Segue Feature couldn’t have come at a better time for me !!! I was just looking for a way to accomplish this task. Quick Question…Shane, YOU didn’t really show it, but you did kinda mention it. Seems that I can actually create a Signup Segue Link then link it to GTW and then create a second connection so that when my customer signs up for the webinar…I can put them on a different list if I want. Yes, that’s correct. You can add more than one connection easily. WOW..Shane so many things are being launched – you gotta make an updated overview webinar man about thrive leads. Good point, Greg. We’ll have to do another training webinar soon. Now that is sweet! Thanks for that. Wonderful new feature! I am looking forward to using it down the road. BTW, what do you think of Active Campaign? Would you recommend them? I use ActiveCampaign and I’m quite happy with it. Will this feature work with WebinarJam or only GotoWebinar? It works with WebinarJam as well, yes. They will be pushed to that LIST, right? Ex: Main list is called MAIN… and other lists are copywriting, blogging, marketing…. To my main list, I will send: Hey, what interests you? Click on the links below and you will be subscribed…. Yes, that’s possible. You’ll have to test it to see how your email marketing system handles new signups (it wouldn’t be ideal if it sends an email confirmation message to each one, for example), but in most cases, this should work without a hitch. A+ on your idea and integration of Thrive Lead’s “conditi​onal redirect.” That was genius! Excellent addition to Thrive Leads! Question: Can this work for adding users to other lists or is it exclusively for webinar registrations? It works for other lists as well. It works with any service that we have an API integration for. Does it work only with GoTo Webinar? That would be a shame… I am using WebinarJam and EverWebinar, for which this feature would be marvellous. THX! Hello Frank. This works with WebinarJam as well, yes. Another great feature. You guys Rock! Incredible how Thrive Team are constantlly working on new features! I’d love to see this in practice for a non-webinar purpose. I love the extra features you guys are constantly adding. I would love to use it to deliver blog post bonuses, direct from the email (for those times I share the full post content inline inside the email) – is this possible? It doesn’t only work for webinars. I just used that as an example, to make the feature easier to explain. I’m not sure what you mean by “blog post bonuses”. Can you elaborate on what exactly you want to accomplish? I was really surprised that you haven’t answered the questions in the comments as you usually do. Will you look at the questions in these comments and answer these via your blog, Imimpact on Facebook or will we have to ask these questions on the Thrive forum. I try to answer all comments, but I can’t always answer them immediately. WOW Awesome update of late!! Couple of things; can it be used or molded some how to be used for how Sid J asked so that if someone within an email clicks a link that are sent into a different list? For example have a main list with education and if someone clicked a link highlighting they were interested in something it would take them into a list to give them more education on that particular interest? With this work with Hangouts on air which is basically what a heap of webinar software plugins are using now? It also works with WebinarJam, for webinars, apart from GoToWebinar. Freaky, but your last two developments or upgrades have literally saved me over $100 a month! You have saved me from purchasing another two products to do tasks that for some reason up until now have been really hard to do. This is a really great feature. Another thing that happens when you get people to sign up again – is that they use a different email ID. So you end up with a database with a lot of duplicate emails – and the tags become useless ( as one email is tagged and the other is not). So 1-Click sign up is just awesome. Yes, that’s a problem I’ve seen before as well. any chance we can get better targeting of widgets? eg to be able to target easily by subdirectory string (sumome has this), or to be able to target by language (with WPML)? Love this new feature. So glad this is apart of Thrive. Question: if I use a custom URL redirect, can the Name and Email be forwarded to my custom URL as part of the URL variables? If not, could they be? Having this functionality would be extremely powerful for some of my clients. I see what you’re saying, yes. I don’t think there’s a way to do this, currently. I’ll have to ask the developers about it. The redirect link does not work on my website. And no support answer. Anybody with the same problem? Please post in the support forum to get help with this. Lately, I have been subscribing to a different events and this is something I was wondering about. It’ll help a lot. My list is in Mailchimp, and I use list fields (merge tags) to segment people by interest area (rather than using separate lists). 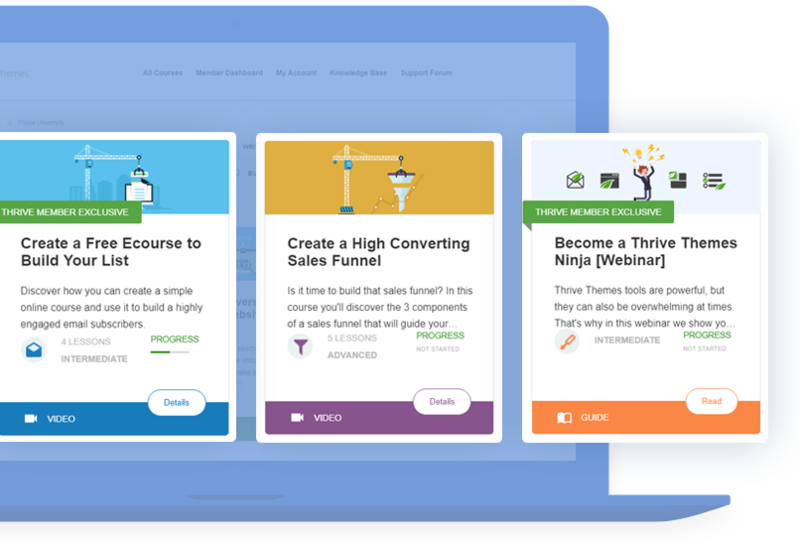 Eg specific lead magnets are set up via LeadPages, to tag users accordingly. I upgraded to LeadPages Pro because of their LeadLinks feature, which I thought would do what Signup Segue appears to do (if I’ve understood it correctly). My key question is – can I use your product to email links to my list that will tag people to certain list fields within my Mailchimp list? I’m getting excited that this could replace LeadPages, which is very expensive! I ‘m excited to use Signup Segue. And I got very close to setting this up. But wasn’t able to use a URL link to redirect to a newsletter created in Mail Chimp. Is there a reason this won’t work with redirect to Mail Chimp campaigns? Would love you guys to do something like deadline funnel. Evergreen counters with evergreen deadline links. Any word on when Signup Segue will integrate with Webinar Ninja? I am using ConvertKit as my ESP, so this is the only remaining piece I’m waiting on. ETA please?? I don’t have an ETA on this for you yet, but it has been logged as an integration to develop. Shane, this is a great feature. Now here’s a big question: Can you do an API integration with Zapier? That way, we’d be able to do a whole bunch of automations between all sorts of services. It’s really nice feature. But why it don’t have the groups option. Like we are unable to add MailChimp groups to Signup Segue. Another +1 for Webinar Ninja!!! Can you make it available for Webinar Ninja, please? I wish you would add Zoom as a webinar option. It looks like you currently only have gotowebinar and webinarjam. I understand why you chose these two options, but I happen to use Zoom. Another vote for an integration with Webinar Ninja, please! I am asking myself how may I do for the same event with my subscribers from my contacts base and new subscribers which come on my website. Should I use a registration page for the new subscribers and a separate signup Segue for the subscribers from my database? so I was trying to figure out how I could achieve this without every having come across the user before. Then i realized that my email autoresponder has this “capture email” which, when you email to it, it subscribes whatever email sent an email to it. awesome. so i connected a button to the link “mailto:mycapture@emailaddress.com” and so when the user clicks the button, their default mail client opens with their email, my subject line, and my body text already pre-populated. In the body text I tell them to “hit send” and once they do, they’re subscribed! BAM! Got about 50% conversion rate with this… so that was pretty awesome for cold traffic. Is this method still work or it is outdated? As i see this article is 3 years old.